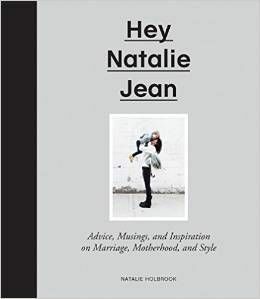 HEY NATALIE JEAN: This Post Two Thumbs Up! My husband is my blog's biggest fan. (Isn't that right dearie?) But sometimes The Holbs reads my posts and doesn't have nice things to say at the end. He checks faithfully every night before bed and I watch him like a hawk as he reads, perched next to him in my pajamas. I like to watch his face for reactions. If I can get Crabby Old Holbs to smile then I have done my job. If Crabby Old Holbs laughs, well then I am catapulted into inner somersaults of glee. Sometimes he reads with his brow furrowed. Then my eyes get large and I start to chew on my nails. He is my biggest fan but he is also my toughest critic. "Is it fantastic?" I ask. "Eh, it was pretty good. It wasn't really about anything, though. I like it when your posts are about things." "Sometimes it is just enough that I report on the day's events." I state matter-of-factly. Sometimes he will call me to tell me how many comments I have. "You have five comments today!" He says from the other end of Pullman through my cell phone. Next to me Barnaby starts gakking. "THIS IS WHAT HAPPENS WHEN YOU EAT CANDY WRAPPERS" I shout while I jab at him with my poking finger. "Don't get too much of a big head with your blog." Holbs tells me. I hear you about the comments. I suppose if I updated my blog more often, made it a tiny bit interesting and actually TOLD someone about it, I might have a reader or two. I enjoy reading your blog and will continue so I can hopefully read that you've been tickled and then read all about your bfp (it took me a long time so I know how you feel), pregnancy, parenthood, etc. I guess I'll be comment four, to make you feel better. Found your blog off cjane's and now you entertain me and make me more sympathetic to those who struggle with fertility issues (not that I was a horrible person before, you just keep me enlightened). So thanks. i always like all your posts. so tell your husband that! i don't even know why I have a blog, it's so lame and boring compared to yours! At least your husband says something. Every once in a while I'll get a comment like, "Wow, I have no privacy, do I?" but that's about it. If I really wow him he'll surface from world wide anonymity and leave me a comment. Very big deal then. But I have never heard him laugh. At me. Out loud. Such a shame, I'm a total gas. As for Moscow, greatest place on earth, let me tell you. Enjoy every second you have there!!! If we could leave the world of special agent earnings, we'd settle ourselves in Moscow and make homemade crafts to sell at the farmer's market on Saturdays. And I really think you're funny. Right back atcha. I started reading your blog after cjane posted about it. And I really like you, so I subscribed! My husband reads my blog and comments -- but sometimes it backfires because sometimes I wish he would just say the comments to me privately!! 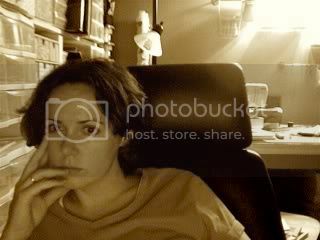 I agree with Serenia - I wish my own "holbs" read my blog! I love these old posts -- they're so funny! My husband is also my biggest fan and biggest critic. I always try to remind myself that the truth lies somewhere in the middle. A question (assuming this isn't disappearing into the ether ... ): How to get real readers? I kind of feel like I'm only read by other bloggers who may or may not be seeking their own ends. And maybe that never changes? I'm so glad I found your blog, and I believe that my blog is somewhat like yours when you first started. My husband and oldest daughter are my biggest fans right now. It's nice to see their reactions, and I hope that someday others will read my blog and find it inspiring, humorous, serious, and kind of fun. I do get random comments, and it feels nice knowing that someone is reading it other than family. I am glad I started a blog, and whether I have 10 or 1000 followers, what matters is the writing that I put in it, and that everything I write is written with love! Take care Nat!